Therapy Chicago: Why Does Attachment Style Matter? Attachment Style: Why Does it Matter? What is the concept of attachment? Attachment refers to the emotional bond that connects an individual to something or someone—a friend, family member, or partner. The psychological theory of attachment (John Bowlby and Mary Ainsworth) identifies four styles of attachment, and most people fall into one of these four categories. How do attachment styles impact me? Understanding your attachment style, and your partner’s will help you better communicate your needs and recognize the needs of your partner. 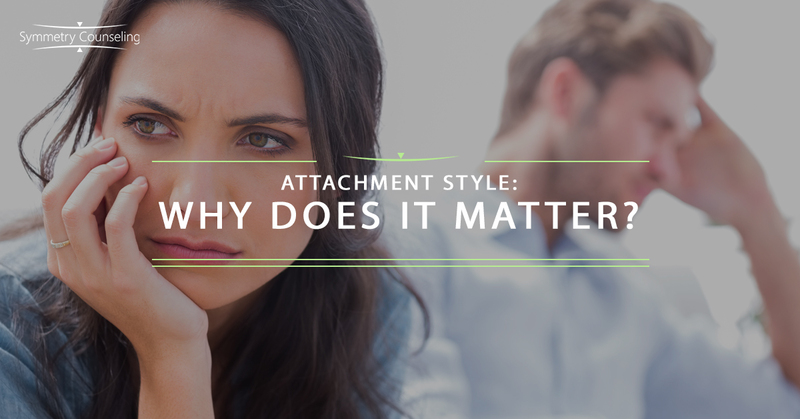 What are the ways in which my attachment style impacts my life? Your attachment style influences the way you connect and relate in intimate relationships. Moreover, the ways in which you react and respond to conflict, the expectations you have of yourself and your partner within the context of your relationship, and your willingness/ability to communicate with your partner, are all informed by your attachment style. “I do not find it difficult to trust or depend on others. While I like to feel independent, I am comfortable with the give and take of depending on others and having them depend on me. I may have moments of insecurity, but I do not often think or worry about being abandoned”. Comfortable with vulnerability, embraces conflict in a constructive manner, enjoys togetherness and independence, open and attuned to needs of self and partner, requires understanding and open communication. “I find it difficult to trust others and therefore do not like depending on anyone else. Please do not depend on me. It is important that I feel self-sufficient, otherwise I will feel smothered and pull away”. “I am worried that without my partner I will not be okay. While I crave intimacy and closeness, I never quite feel like I’m getting enough from my partner. My ultimate fear is that my partner doesn’t value me and will ultimately abandon me”. “I find it difficult to get close to others because I worry I will ultimately get hurt and feel abandoned”. According to Attachment Theory, one’s attachment style develops in direct response to the responsiveness of his/her childhood primary caregiver. If your primary caregiver was unresponsive, neglectful, and unavailable, it is likely that you developed an insecure attachment style (avoidant, anxious, or disorganized). That is not your fault. It may not even be the fault of your primary caregiver. This is just information that can help inform what you may need to work on, ultimately giving you the opportunity to develop more compassion for yourself, your partner, and any relational struggles you may be experiencing. Which of these four categories seem to best describe you? Are you aware of the ways in which your past relationships inform the ways in which you connect intimately with others? This may bring awareness to an area in your life which could benefit from greater support or deep healing. How would you categorize your partner? Do you feel like you understand who he/she is and why? If not, maybe there is more for you to explore together. After all, vulnerability and intimacy go hand in hand. An open dialogue between two trusting partners can set you on the path towards greater understanding, greater ability to empathize with each other, and ultimately deeper intimacy within your couple bond. Conversely, perhaps you or your partner’s primary attachment figure impacted his/her early childhood bonding in a way that is affecting your relationship today. A greater awareness of these nuances is a powerful tool that will help you navigate your relational experiences and what you may want to explore in therapy. Bretherton, I. (1992). The origins of attachment theory: John Bowlby and Mary Ainsworth. Developmental psychology, 28(5), 759. Cassidy, J., & Shaver, P. R. (Eds.). (2002). Handbook of attachment: Theory, research, and clinical applications. Rough Guides.